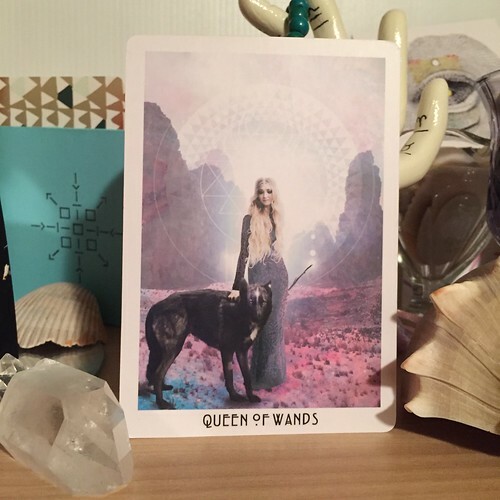 I love this Queen of Wands! I feel her wild, passionate energy vibrating out of the Sri Yantra behind her. The black cat has been replaced by what looks like a dog but to me, I interpret it as a wolf. The wolf is such an interesting animal because I think of it as a wild, free, and highly intelligent. I feel the fiery passion in the wolf’s howl, much like the fiery passion in the Queen of Wands. Her fire burns bright, which helps her find her words and thus, directing her passion with laser focus. This month, our friends in this card are inviting us to do the same. Where can we laser focus our intentions, passion, and drive? Where can we be wild and free? How can we use our intelligence to direct our fire? Personally, I feel like my passions are directed all over the place, which isn’t really helping my focus. I feel more like a wild fire that is out of control rather than a contained fireplace fire, directing all of my energy towards a specific goal (if that even makes sense!). Though she may be determined, the Queen exudes compassion and love in her expression as she gazes lovingly at her companion. Maybe the wolf represents her goals. Maybe the wolf is the wild expression of where she wants to go. She is approaching her goals with compassion and love which, in turn, will yield great results – IF she stays the course. Let’s reflect on the year so far and really check in to where we want to be. 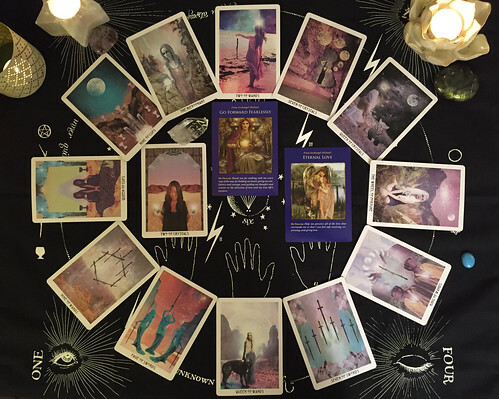 In January, we had a choice to make, a path to pick, with the Two of Wands. February gave us the Seven of Crystals, where we were asked to assess our growth so far. The Queen of Crystals visited us in March to check in with our self-care and to make sure we are acting in the love for our selves. What is in alignment for us? What is working and what isn’t? April‘s Wheel of Fortune was giving us that necessary nudge (or push) towards our goals and to embrace the change headed our way. Did the fiery King of Wands in May light up the path towards where we need to go? Did you listen to your inner fire and passion? Did you follow the spark? Did we watch our backs or find that we gave away too much of ourselves in June when we received the Seven of Swords? How are all of these coming together for you? Take some time to journal or meditate to really check in and see what’s going on so far so you can figure out your next steps forward.